This gem of a read has interest for everyone. It will appeal to those who have made a five-kilometre jog the limit of their running experience as well as those aspiring to run distance – particularly the length of the country itself. Those who enjoy living their adventures vicariously from the comfort of an armchair and who may have never given the sport a second thought will also appreciated its page-turning grip. A rich vein of wonderful and quirkily descriptive English flows from Gavin’s Scottish pen like a seasoned wordsmith. He places you so firmly into his running shoes that as someone in preparation to complete the challenge myself I was actually a little disappointed – because thanks to Gavin’s exciting, detailed and inclusive narrative I feel like I’ve run it already and have to do it all again! In truth, alongside Gavin’s clever observations, ever-present sense of humour and self-deprecating wit, there’s a wealth of winning detail, from planning and navigating the route, to booking accommodation, liaising with support vehicles, which kit to take and what to fuel your body with. ‘Downhill from Here’ is not pitched to the wannabe-macho somewhat naïve audience that lap up over-hyped nonsense. You won’t see our ‘hero’ surmount impossible odds or breakthrough a superhuman-pain threshold and the barriers of endurance while achieving a cheering mass of mere mortal followers struggling to keep up with his momentous pace in the Rocky Balboa-style. Gavin not only tells you of his personal history, shortcomings and motivation but also – and quite often! – how not to go about running from John O’ Groats to Land’s End. Candidly, he retells how he loses his way on many occasions, which has you shivering on top of a Pennine Peak clad in a pair of shorts with him or up to your neck, camera equipment held aloft, attempting to ford a bitterly cold river. You can expect the police and the goodwill of strangers, hikers, pub landlords and farmers to help our protagonist on his way on more than one occasion. And how delighted was I to find that after running with Gavin for less than half a day (when his 1117-mile route passed twenty miles from my home) and being treated to a meal for my efforts, he went on to include a couple of pages about my own life story along with a photo which makes for a great souvenir. Gavin is honest and generous, an accomplished writer (and filmmaker) and a credit to the long-distance or ‘ultra’ running community. 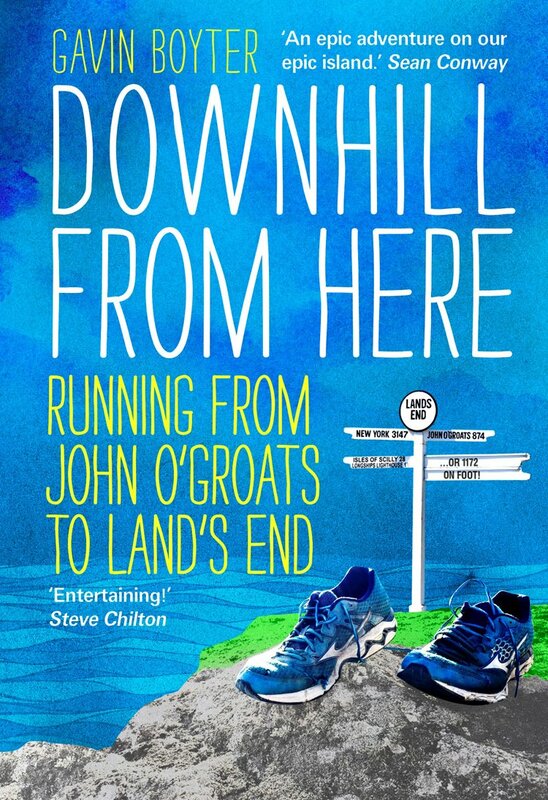 This book makes for a seminal text with respect to ‘running’ that most British of British endeavours, the JOGTLE.